Hot Tub Heaven #3, like our other eight properties, is located on Blue Mountain in Linden, Virginia and is open year round. Surrounded by the Blue Ridge Mountains in the beautiful Shenandoah Valley it offers two queen-size beds and one full bathroom... A fully equipped modern kitchen, a gas-log fireplace, free wi-fi, big screen tv, turntable with vinyl record collection and on the deck are a grill for cookouts and a 6-person hot tub. Plus, dogs are welcome! This home also offers a fenced-in yard for doggy guests! Hot Tub Heaven #3 is located only minutes from Shenandoah National Park, Sky Meadows State Park and the start of Skyline Drive... 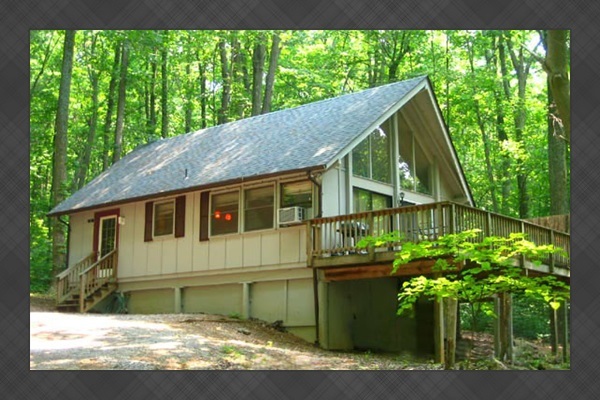 This cabin is in the heart of Virginia Wine Country! Explore dozens of wineries all within 30 minutes of the cabin! Click here for a map of the local wineries. You will also enjoy access to our community's Deer Lake (picture) - enjoy fishing and swimming right down the road from the cabin. Each season of the year has its own charm and attractions.... Canoeing, hiking, horseback riding, kayaking, antiquing, golfing and fishing are all activities local to our area! Plus, the Appalachian Trail is just up the road - at the top of our mountain - it's about a three minute drive from HTH #3 to the entrance of the AT! We look forward to accommodating you on a very special mountain getaway. Now at Hot Tub Heaven we offer... In-Cabin Massage Therapy! Massage services offered... Therapist will travel to you - to your cabin! This is a real treat and would make a great surprise for a loved one! Click Here for detailed information including, how to contact Cheryl and previous guests' massage testimonials. Cabins are a Flat Fee per Night. Not based on number of guests. Please remember, no Saturday check-in or check-out. Two night minimum. Email to inquire about one night stays. Front Royal Canoe Company - Front Royal, VA; 540.635.5440 They're only 15 minutes away from the cabins and they're the best! Open April 1 - October 31. Operating from 9 to 6 weekdays and from 7 - 7 on the weekends. Please tell them we sent you! Coupons available at the cabins for your River Trip! Dog friendly too! Down River Canoe Company - Bentonville, VA; 540.635.5526 Offers canoe trips on the South Fork of The Shenandoah River. Enjoy an unforgettable day of fun and adventure on one of America's most beautiful rivers. Virginia River Trips - White Post , VA; 540.268.0727 Tubing, Canoeing, Kayaking, Rafting Only 1 Hour From D.C and just 20 minutes from the cabins!